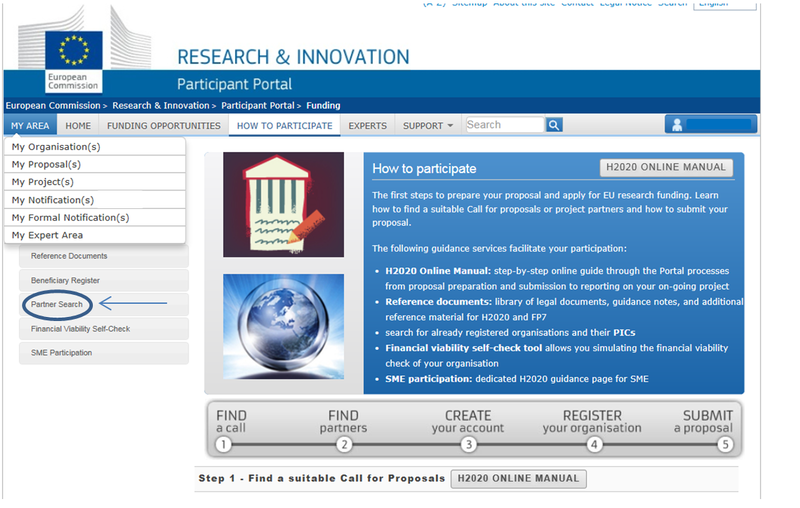 The European Commission’s Participant Portal new Partner Search is now ready to use. 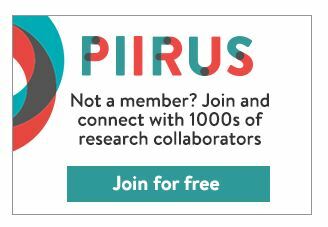 This search allows you to find potential partners for your research project, based on organisations already registered on the Portal and in receipt of funding. As part of this, there is a useful overview of the organisation and its interaction with European funding schemes. Access is also given to top level information about funded projects. The Partner Search can be found under the How to Participate tab and can be used whether you are logged in or not. The Partner Search allows you to search by organisation name, a key word or topic. There is also the option to filter by country, organisation type or programme. If you see a partner you would like to find out more about, you can click on the organisations name to go to their page. On the organisation page you can find a blurb of the organisation and a full list of key words. Note that some of these have been entered manually and some are taken automatically from the European funded projects the organisation has. 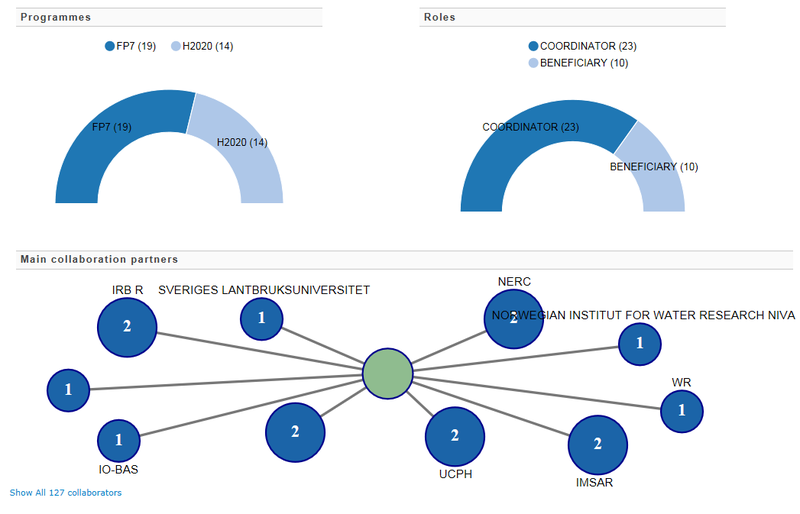 To help see potential network opportunities, further down the page you can see information on who the main collaboration partners are for that organisation and the type of role it usually holds in a project. 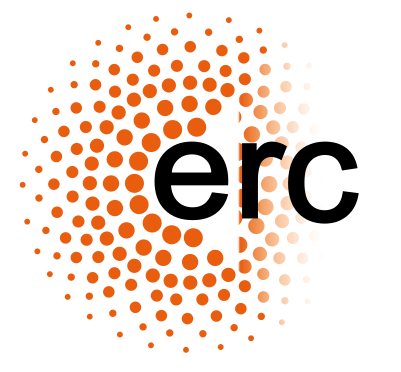 Finally there is a list of all the European Commission funded projects that the organisation has and a link to contact that project team direct. This tool complements the other partner searches already available. Why not have a look and see who has funded projects in your field? 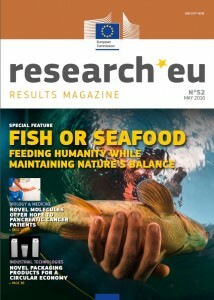 Research*eu: results magazine – always relevant to BU! Why not check out this issue, and previous magazines, for projects related to your research interests and who, in your field, is leading the field with European Commission funding. You never know, you might find your next grant partner here. The next issue will focus on the path to life beyond earth – ensure that you see our next update by signing up to your own BU Research blog alerts. If you have completed or are close to completing EU-funded project, you could be appearing in a future issue of this magazine – check out how to do this on the back page of the current magazine or contact your Project Delivery Officer. If you are looking for partners or would like to offer your expertise on a bid, add your profile to CORDIS and to Piirus. For assistance with your EU and International funding, contact Emily Cieciura, RKEO Research Facilitator: EU & International or your Faculty’s Funding Development Officer. 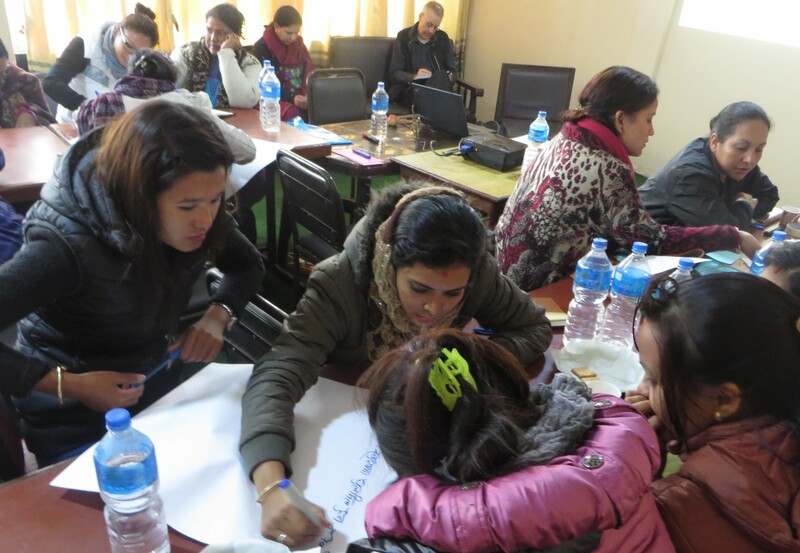 A few days I posted a short report of our first session as part of the THET-funded project ‘Mental Health Training for Community-based Maternity Providers in Nepal’, see this previous post here. 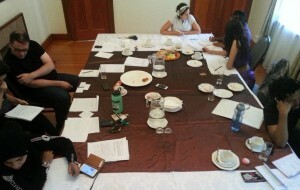 Yesterday we completed the final third day training of the first session of this BU-led project. Over three days we had 70 ANMs (Auxiliary Nurse Midwives) in attendance, which we think is (nearly) all such staff based in all birthing centres in the district (=province). The three days were the same, i.e. each session was repeated twice so each day one third of the ANMs could attend, and two-third could be at work in the birthing centre ensuring women could deliver safely. As part of this project we send UK volunteers (health and/or education) experts to Nepal to offer high quality training in areas where it is most needed. Further detail on this BU-led THET project can be found in our scientific paper Mental health issues in pregnant women in Nepal published in the Nepal Journal of Epidemiology available through Open Access. Mental illness is still very much a taboo topic in Nepal as it has often a serious stigma attached to it. Moreover, the relatively short training of ANMs is often fairly basic and the national curriculum does not cover mental health issues in any detail. 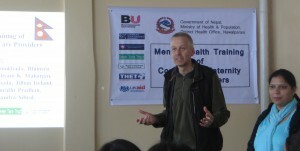 This joint project between Bournemouth University, Liverpool John Mooores University, Tribhuvan University and the local charity Green Tata Nepal addresses issues about mental health in general and in pregnant women and new mothers in particular. Tribhuvan University is the oldest university in Nepal and one of the ten largest universities in the world (based on student numbers). The project is multi-disciplinary involving midwives, (mental health) nurses, and doctors as well as global health researchers, educationalists and sociologists. This month’s results*eu includes a number of live research projects that are of interest to researchers at BU. Keeping up to date with EU research can inform your research and suggest potential collaborators for future bidding development. 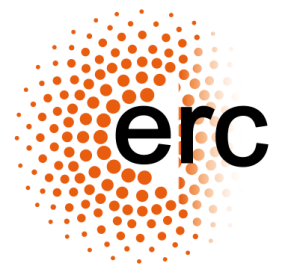 HEMOLIA – cutting-edge technology in the fight against global financial crime. 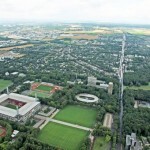 Ever since BU has built relationships with German Sport University Cologne – arguably, the leading global sport university – in 2012 it has been an evolving partnership in terms of student exchange, teaching and research collaboration as well as other academic and industry-oriented work. Recently, lead contact Dr Tim Breitbarth’s visit has further maintained and widened this link. Mainly, he taught on international sports marketing and management Masters courses; discussed potential future collaborative teaching formats (such as the already co-organized international student management games); met with current BU exchange students in Cologne; and outlined a joint paper on ‘sponsorships as B2B relationships’ based on empirical data from a student dissertation; and defined the direction for a submission to the Marie Skłodowska-Curie Research Fellowship Programme. 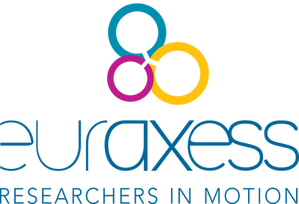 There is much going for strategically developing Erasmus links, especially if departments seek to extent relationships with European partners beyond student exchange only (arguably, both the core and a starting point). Firstly, it steers EU money towards BU (for both students and staff). Secondly, travel is usually much cheaper than to overseas destinations, so more interaction is likely (and: likely to be funded). Thirdly, there are lots of EU research funding opportunities that require/encourage collaboration within Europe. Fourthly, there is much intercultural learning available for students (and staff). Also, after all, 60% of UK trade is with Europe. 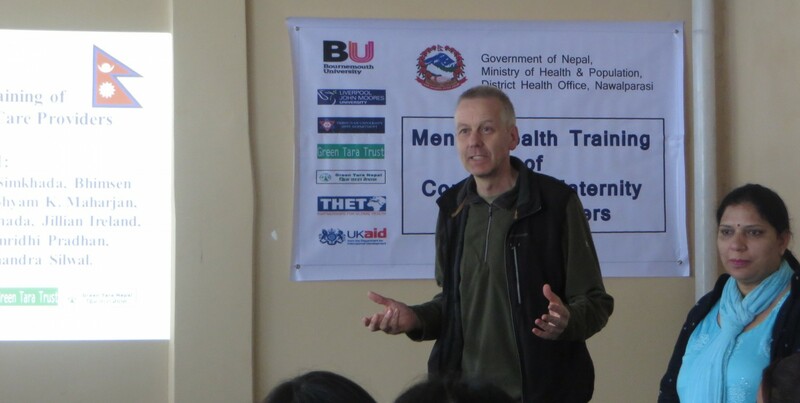 On 6th April, Easter Monday, professor Edwin van Teijlingen will present the process and selected findings of research capacity building work conducted in Nepal. The invited lecture at Social Science Baha in Kathmandu was originally planned for early January, but unfortunately had to be cancelled at the last moment due to a national strike in Nepal. PARI (Partnership on improving Access to Research Literature for Higher Education Institutions in Nepal) refers to a project to support and enhance health research in Nepal; a partnership between Tribhuvan University, three UK universities (including Bournemouth University), and the Development Resource Centre (Nepal). The British Council and DFID (UK) funded PARI to help build research capacity over a three-year period. Nepal has limited capacity in health research, which restricts ability to implement evidence-based health care. PARI aimed to move university lecturers away from textbook teaching and make them more critical of the academic literature available on the Internet. PARI workshops delivered to Nepal universities introduce the foundations of evidence-based practice and outline key electronic databases of health care and health service literature available to Nepalese academics. These workshops were informed by: (1) a curriculum review of all health-related courses at the major universities in Nepal; and (2) a needs assessment with lecturers, librarians and students of the major universities. Key message included that We need to move away from textbook teaching in health care and teach health-care discipline students how to find the most appropriate evidence-based treatment for each patient. Padam Simkhada, Liverpool John Moores University, UK. 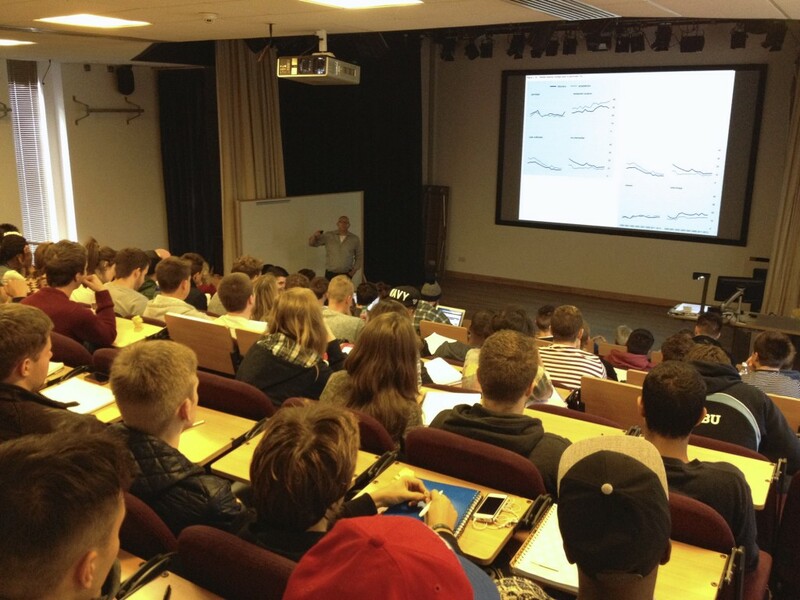 Dr Tim Breitbarth (Sport Academic Group) has been successful with his recent bid for Fusion/EU funding for teaching exchange visits to partner institutions in Groningen, The Netherlands, and Cologne. At German Sport University Cologne Tim – who is also Programme Leader MSc Sport Management and Coordinator Internationalisation Sport at BU – will teach at their high-profile Masters in Sport Management over four days. The Masters attracts about 200 applications per year from within and outside Germany, but only 30 students are allowed into the course. 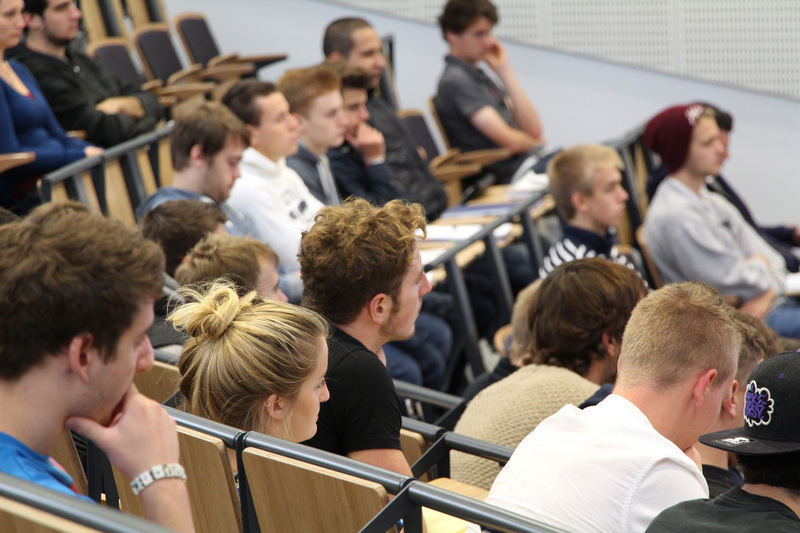 The visit to Sport’s Erasmus partner institution Hanzehogeschool Groningen will include tutoring of international groups of students who participate in a multi-day management game. Besides teaching commitments, the trips will help to move along joint research and publication projects with his European colleagues, such as editing the Special Issue on sport and social responsibility of Corporate Governance: The International Journal of Business in Society. In addition, they have been cooperating on conference and workshop organization and will once again co-lead a track at this year’s European Association for Sport Management conference. Also, Tim and his BU colleagues were successful in securing internal funding for the first time in order to take the Sport Management and Sport Management Golf final year cohorts to a four-day intense international student management game in Cologne in late March, which he co-organises. 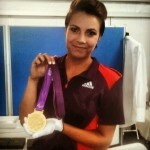 Hence, collaboration with, arguably, the world’s largest and renown sport university, has been in full swing with also two BU students on study exchange in Germany in semester 2 and PhD student Emma Mosley receiving training at their specialised Institute for Sport Psychology thanks to a Santander award. Developed by Bournemouth University’s Dr. Anna Feigenbaum alongside Dr. Mehita Iqani, the Teaching Exchange Workshop was designed to foster a space for collegiate interaction and sharing experiences of the challenges and opportunities involved in teaching. Piloted at five Universities across the country in 2010-2011 through support from the Higher Education Academy, the Teaching Exchange Workshop offers colleagues a chance to work through departmental issues including curriculum development, diverse student expectations, and teaching time management. 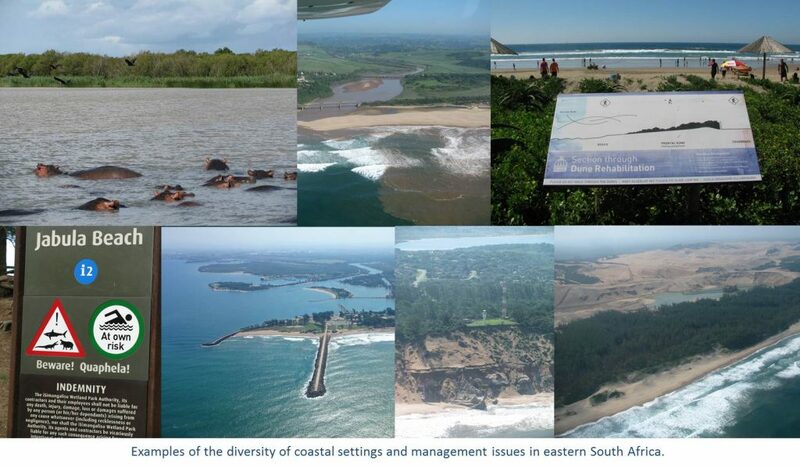 On November 8, 2013 Dr. Feigenbaum was invited to South Africa to facilitate the first international Teaching Exchange Workshop at Wits University in Johannesburg. Drawing on successes of the pilot workshops in the UK, the Wits workshop featured new participatory exercises for generating innovative assignments that bridge practice and theory, and for problem-solving challenges associated with teaching in a time of 24/7 email and social media access. 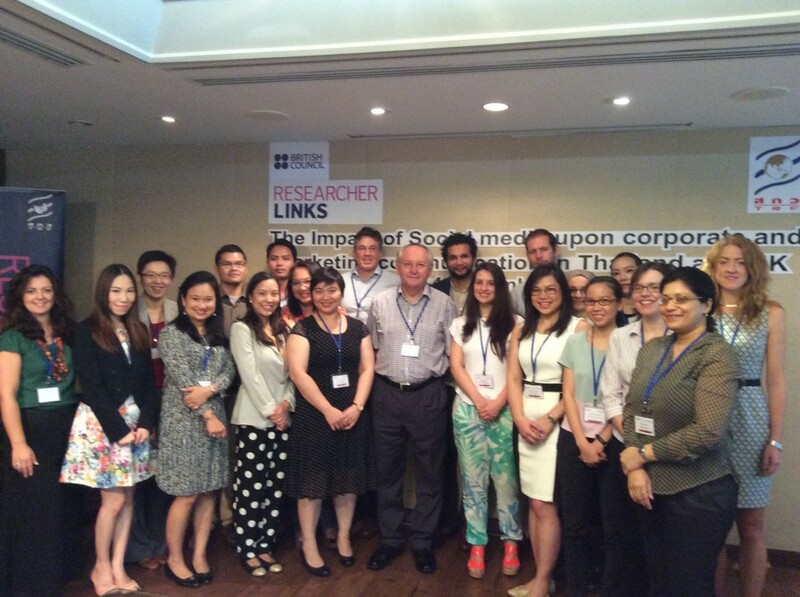 As a low-cost and high productivity model for teaching quality enhancement, Dr. Feigenbaum and Dr. Iqani are keen to see the TE Workshop continue to grow both nationally and internationally. To learn more about the Teaching Exchange Workshop, you can download a free TE Workshop handbook. You can also read a sample of pilot study results published in the Journal of Further and Higher Education. 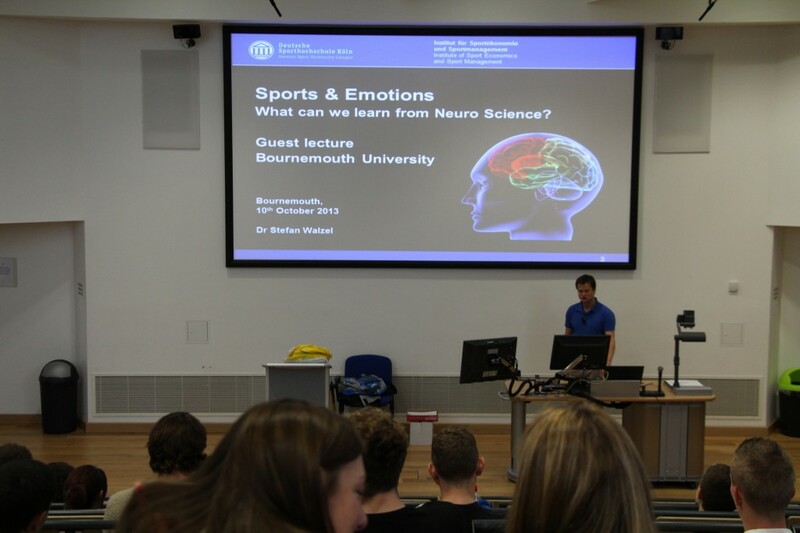 Once again, beginning of October the Sports group hosted senior academics from some of its European partner universities in order to provide students with international insights into topics of their study and future career. In addition, the visitors worked with BU staff on progressing international research agendas and teaching models, such as intercultural mixed-group student management games partly facilitated via online conferencing. Dr Stefan Walzel (German Sport University Cologne) and Gerco van Dalfsen (Hanzehogeschool Groningen and Secretary General European Association for Sport Management) presented and discussed with students of all UG/PG levels and all Sport pathways topics of neuromarketing, sport city strategies, leadership and provided insights into the employability and career prospects of their own respective graduates. Both visitors stressed the need for their universities to include an array of international activities and learning experiences into their students’ curriculum in order to lift their competitiveness on an increasingly international job market. Together with BU sport management colleague Dr Tim Breitbarth, they also progressed a collaborative international study on community perceptions of professional sport clubs’ social responsibility initiatives by collecting further data in Bournemouth. 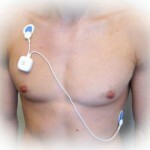 A fourth set of data was collected in the USA end of October. 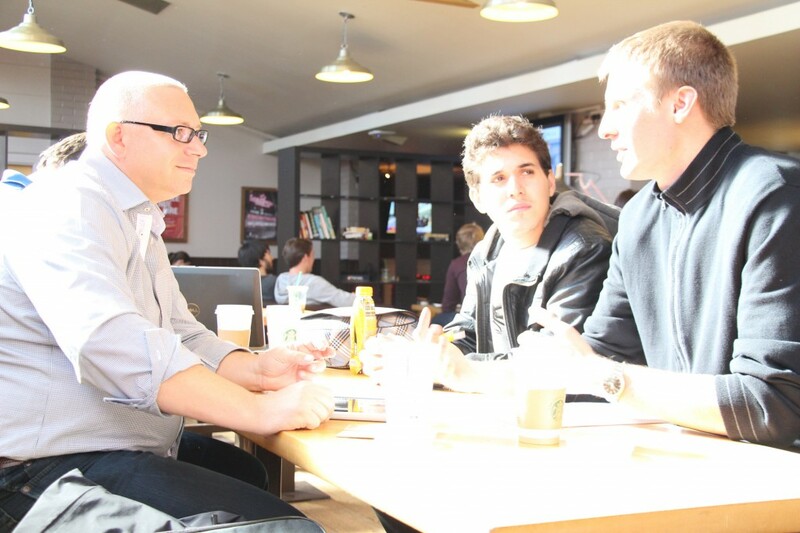 Gerco and Stefan were also very interested to meet with BU sport students who will study in Cologne and Groningen in semester 2, and receive feedback from the Sport group’s ever-first incoming Erasmus exchange student in order to manage expectations and processes for future exchanges, such as the four students arriving in Bournemouth for semester 2. 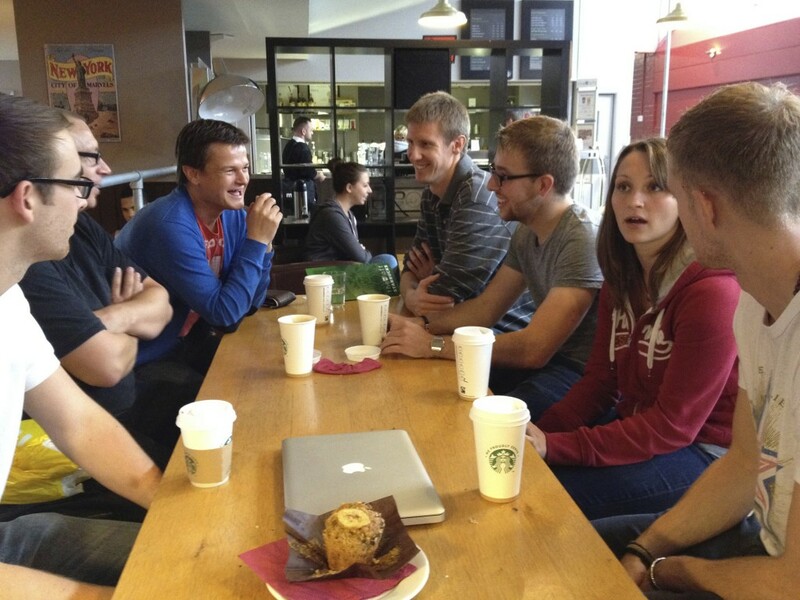 European visitors and incoming/outgoing Sport students get-together.